Only his second week Ian is already hitting his stride, Very Silverback! 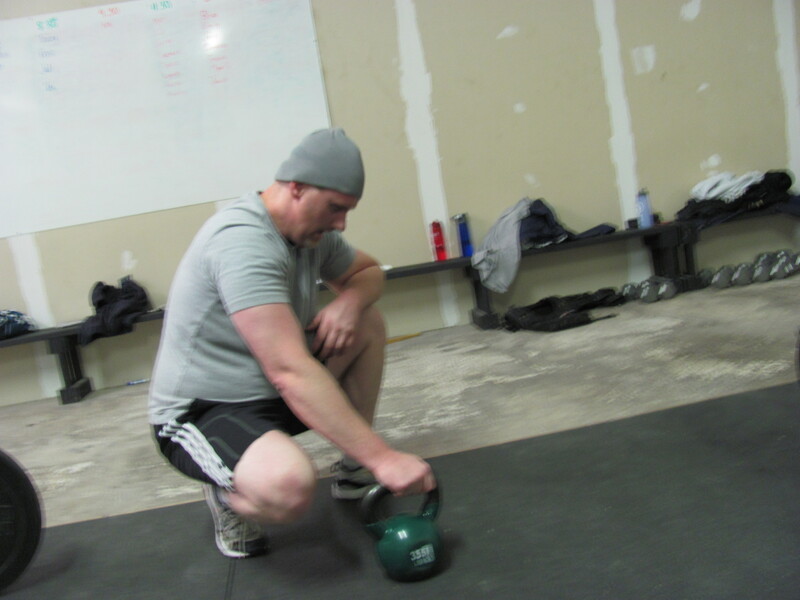 New athlete Cory gets acquainted with the Kettlebell. Welcome to the Silverback Nation. Going to be the first wod back… oh boy. 11:14 Rx This was really fun. I spent a lot of time putting on gloves for the thrusters/kbs and taking them off for pull ups. You may say it’s not worth it, I disagree. It was 27 degrees people. Ummmmm……. I had no clean work-out clothes???? I thought i knew all the lingo, but apparently not. 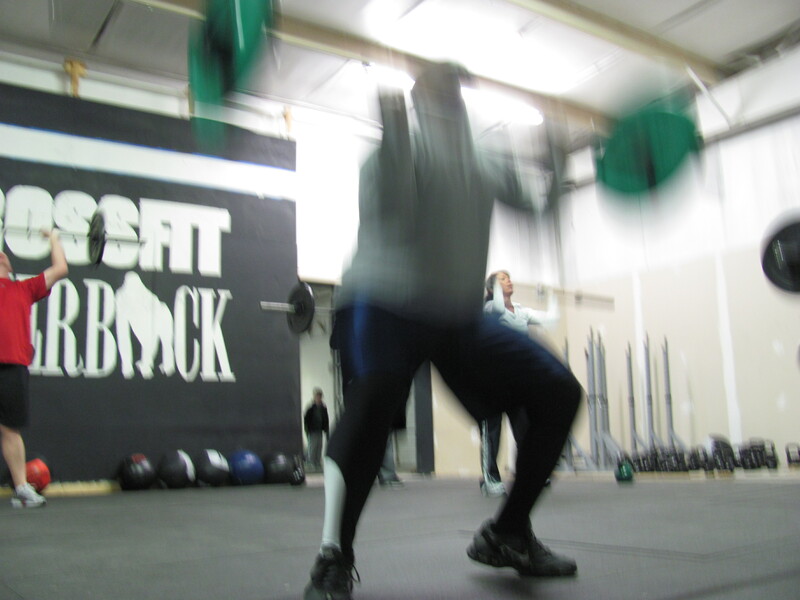 How is a front squat push press different from a thruster? Really? I did 60 of them this morning and they felt like thrusters. We were doing thrusters, I’m sure of it. Matt – CF HQ has put out a bit more information about the qualifying process for this year’s Games. I copied some of the info and will bring it tonight. You can qualify through an affiliate or by video submission. Obviously, using an affiliate is simpler for the athlete but involves work for the affiliate. I, in the master’s 45 – 50 bracket, would like to give this a shot (unlikely I will go anywhere but would like to test it out). I am happy to help coordinate, but this would still require a bit of a commitment from you. But it could also be a fundraising and/or awareness tool for CFSB (advertising that local athletes can qualify at your box). I don’t know how many other CFSBs are thinking about trying to qualify. Bring it on, happy to support your efforts and anyone else that is feeling froggy. Thanks, Matt. And for those interested in how the Affiliate qualifying will work, it’s the same. Individuals will do the same posted wods for six weeks, the affiliates with the top scoring athletes can then send a team of 6 or more to Regionals. Agree there are no snow days at Silverback, unfortunately there are sinus infections. Getting antibiotics and hope to be back on Monday. Need to get ready for “cookie drop” on tuesday. Tell me God doesn’t have a sense of humor. I have totally lost my voice and the kids are home with a snow day. SERENITY NOW! 5:30 workout kicked my tail! Great to see such a turn out for the 4:39 class, everyone did an outstanding job navigating the workout and pull up circus!! My WOD was dealing with stupid people yesterday!!! Time: 24hrs…. You probably had the hardest workout of the day Val. In Dallas today rowed 2K at 7:01.